Cypress College Gallery Director and artist Paul Paiement states, "the show has been well attended with repeat visitors who actually spend time looking at and asking questions about the installations." Don't we love that! In the twenty days the show has been open to the public (those are gallery days open), they estim ate that 1,500 visitors have come to see the show (and this is a 2,500 square foot gallery located 30 miles south of downtown LA). We are very please with responses by Cypress faculty and administrators who are impressed that the show also includes work by an architect and landscape designer. It seems they also like that the artists are seeking to convey messages that get people thinking about the real world, a relevant conversation beyond the art itself. 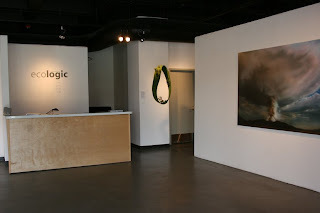 Many hours have been spent updating the blog for ecoLOGIC during the show with information on related lectures/panels/exhibitions/links and we would like to direct our ecoartspace blog followers to check it out at http://ecologicla.blogspot.com. If your in Los Angeles this weekend, this is your last chance to see the show.